Last week I asked Australian economist Steve Keen what he thought about the St. Louis Fed article on the Social Cost of Transparency. "I study a class of models commonly used to motivate monetary exchange, extended to include a physical asset whose expected short-run return is subject to exogenous news events, but whose expected long-run return is independent of this information"
The part of bold is the give: this is a model where the future is subject to randomness, but not change: whatever happens in the short term has no impact on the future. It's like Friedman's "helicopter money" model in which the economy always stays at the same level of output (in the no growth version) or where growth is always constant. 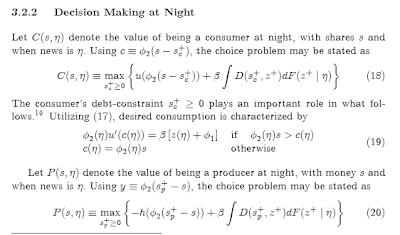 This is precisely the sort of modeling that failed to even conceive that the Global Financial Crisis (GFC) was possible (for instance, there is no runaway accumulation of aggregate debt in this model). How then can it be expected to inform policy in a post (or present!) GFC world? The author, David Andolfatto, creates a mathematical model which is self-contradictory. The model contradicts itself mathematically by defining certain conditions to only exist after the fact (at step N+1), while at the same time using these mathematical conditions on date 1 during his attempt to address reactions to news on date 1 (in the model). The mathematics used to support his claim is logically false. If his mathematical models as currently defined describe reality it can best be attributed to a lucky guess. Not only is the model an unrealistic picture, it is based on faulty mathematical reasoning. Here is a link my Criticisms Of The Fed's Article. I have contacted the author of the article, David Andolfatto. He told me that he will change the paper to fix the inconsistency I pointed out in my critique. I am doubtful of whether he will change his conclusions. He does not provide empirical evidence to support his claims in the paper. This is the biggest drawback of the paper. I have no problem with mathematical abstraction to model reality. Without concrete evidence though, at the end of the day it is just abstract mathematics. I can come up with a hundred different abstract mathematical systems to model electrical current in circuits. They may all have logical and consistent mathematics, but that doesn't guarantee an accurate description of reality. At the end of the day a good model will follow from experiment and observation, not the other way around. Please do not forget that almost all state universities teach Keynesian mathematical economics. When was working on an MBA from MU the professor in one such economics course offered an equation, which I cannot remember. He had to hold a couple of variables ceteris parabis to solve the equation. After solving the equation I simply asked about the possibility the at least one of the assumptions was not correct, how would the solution differ - for which he had no immediate answer. He said he would get back to me with an answer the next day - which he never did, though I asked again numerous times over the next couple of weeks. The problem is that subsequent theoretical studies are based upon that initial "solution". When I studied mathematics in undergraduate engineering relating to a statistical analysis of a mathematical fit to a scatter diagram, there was always and upper and lower bound. Not only did they often have boundary condition equations different from "statistical" equation, but one could not blindly assume that the basic equation was good "beyond" the bounds! IMO we went beyond the bounds of the fed Keynesian equations in 2008, and they didn't know what to do. The fed and banksters are still clueless - but they are going to get theirs while the getting is good, so to speak. Please consider C. J. Maloney's Financial Sense article written in 2004 called King Of The Mathletes. Maloney refutes the Phillips Curve by taking into consideration changing dynamics. Steve Keen would agree that changing dynamics are paramount. The Phillips Curve is the supposed trade off between unemployment and inflation. The problem with the Phillips Curve is that nobody has the slightest idea how to accurately measure it, and by the time the data is in, it’s already changed again - it being a constantly moving target. So besides being completely immeasurable, the Phillips Curve was discredited three decades ago - except in the minds of whiz kids who worship the idol of Math. It’s not a bad theory, they say, it just “shifted adversely” on them, much like that iceberg shifted adversely into the path of the unsinkable Titanic. How can one use mathematical formulas to “manage” the economy when – and even the Mathletes will admit this – those formulas consist entirely of [constantly changing] variables? I added the words "constantly changing" to the preceding sentence. Thomas Sargent's idea sure worked out, didn't it? David Andolfatto's idea about secrecy is equally silly. The clear conclusion of this exercise is the Fed's Defense of Secrets publication (conveniently named "Social Cost of Transparency" so as to not alarm the masses) is nothing more than neoclassical gibberish, just as Steve Keen said. The problem is Bernanke in particular and central bankers in general placed (and still do) complete faith in such gibberish, so much so that they lost any sense of real world actions by real people, actions that are dynamically changing faster than the Fed can possibly gather data. This by the way, is why the Fed is always chasing its tail, constantly behind the curve. The result of Bernnake's blind allegiance to mathematical gibberish is that in spite of his PhD, he could not see a housing bubble that was obvious to anyone using a single ounce of common sense. Attempts to understand the Fed's math is beyond the scope of all but 1 in a million people like Frank Palladino. Fortunately you do not need to be a math wizard to understand how ridiculous the Fed's policies are. The same applies to Defense Of Secrets, no matter what modifications Andolfatto makes to arrive at his preordained conclusion that "secrets are a good thing". Had Bernanke simply opened his eyes instead of relying on mathematical wizardry, the credit/housing bubble would not have gotten as big as it did, and we might not be discussing the above ridiculous mathematical formulas that supposedly show us the Fed needs to be secretive. The real source of the gibberish is not putting propositions in mathematical form--because that's a large part of being able to express your ideas systematically--but by having gibberish propositions to begin with. That's the true weakness of that "secrecy" paper: to imagine that such a stylized model bears any relation to reality at all is delusional. This happens because neoclassicals fall for the fallacy of believing that the economy is populated by hyper-rational agents who push the system towards a desirable equilibrium at all times. Their math encodes that belief and is therefore wrong--but the objective of trying to mathematically specify realistic dynamic causal models of the economy is still a reasonable one.